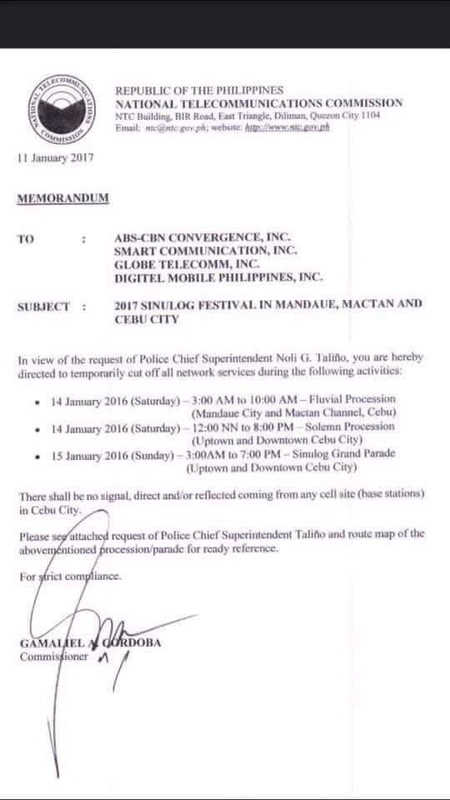 Telephone networks will block all cellular signals in Cebu during the Sinulog Festival today (Saturday, January 14) and tomorrow, the government has announced. Sun, Globe, Smart and TNT are acting in accordance with a directive issued by the National Telecommunications Commission (NTC). Although no specific security threats have been received related to the Sinulog festival, the pre-emptive measure, will focus on areas along the route of the procession of Santo Niño de Cebu and the Festival Grand Parade. ALSO READ: Bramovich: What on earth is going on at the palace? Is anyone talking to anyone? Land lines will remain active. Cebu City will also be a “no-fly zone” for drones during the parade. Similar counter-measures were put in place during Manila’s feast of the Black Nazarene in Manila this week. City mayor Tomas Osmeña has apologised for the network shutdown, saying that it is an “inconvenience” that will help guarantee the safety of revellers. “I’m very sorry for the inconvenience of the cell shutdown, but it is an inconvenience that can save lives. The Hilongos terror bombing in Leyte a few weeks ago involved two bombs, of which one failed to detonate. The detonator on the retrieved bomb was designed to be activated by cell. The bomb that exploded in Davao last September was also likely detonated by cell,” he explained. He also said that police and medical personnel will be deployed all over the city, and easy to contact even without cell phones. The mayor also appealed for festival-goers to assist security forces by reporting anything suspicious. “Even with the additional personnel the military is sending, the police is still a force of thousands trying to protect a population of millions. They cannot be everywhere all the time,” he said. For our complete and comprehensive calendar of Sinolog events, click here. Bramovich: What on earth is going on at the palace? Is anyone talking to anyone?